Every year scores of official aid agencies, foreign ministries, international organizations, transnational non-governmental organizations, private foundations, and for-profit development organizations design, fund, and implement thousands of projects aimed at advancing democracy in over one hundred countries, spending somewhere in the neighborhood of $10 billion. Multiply this annual activity by the fact that such assistance has been underway now for more than thirty years (although it was a smaller field in its early years) and it becomes evident that the total amount of activity making up the domain of democracy assistance is enormous. Sarah Sunn Bush. The Taming of Democracy Assistance: Why Democracy Promotion Does Not Confront Dictators. Cambridge: Cambridge University Press, 2015. ISBN: 9781107069640 (hardback, $99.99); 9781107642201 (paperback, $34.99). This extremely extensive set of activities ‘on the ground’ is not matched by a correspondingly weighty amount of independent research and analysis of it. Certainly some important books, reports, and articles examining different aspects of democracy assistance have been written, with the tempo of the publication of such works quickening in the past ten years. Yet many major aspects of the field remain only lightly touched by research. And very few analysts have attempted to apply quantitative social-science methods, with most relying instead on qualitative analysis. Sarah Bush’s book is thus a welcome arrival. It examines democracy assistance through a novel lens– assessing not whether it is effective or not, or good or bad, but instead how politically confrontational or not it is vis-à-vis host governments, and how that characteristic of democracy assistance has been changing over time. Within the multitudinous field of actors, her focus is on assistance of the U.S., the largest donor in the field. More specifically she concentrates on the work of the National Endowment for Democracy, and to a lesser extent the United States Agency for International Development. Her challenging finding is that over time U.S. democracy assistance has grown less politically confrontational of host governments—in her words, more ‘tame.’ She argues that the cause of that change is not, as one might expect, an increasingly cautious U.S. government pulling its pro-democracy punches out of a desire to get along with useful nondemocratic allies, but instead changes in the interests and methods of the nongovernmental organizations that implement such assistance. These NGOs, according to her research, have been shifting over time to tamer assistance out of a desire to maintain their market share and ensure organizational survival. In short, the raw incentives of the marketplace of democracy assistance are driving them to avoid alienating recipient governments so that they do not lose their place in those countries. The four reviewers all praise Bush for the broad scope of her analytic ambitions, the seriousness of purpose, and the nuance of approach evident throughout her account. They differ considerably, however, in their assessments of the success of her efforts. Overall, the two reviewers coming from a more academic perspective are more positive while the two reviewers closer to the policy community take a more critical line. The major axis of disagreement among them concerns how well Bush’s tightly constructed application of quantitative methods works in achieving a better understanding of democracy assistance. Maryann Deloffre believes that “Bush’s multi-method approach and varied evidence are particularly well-suited for testing her argument.” Hans Peter Schmitz highlights “the author’s immense analytical breadth and depth brought to the most salient aspects of this topic.” In contrast, Larry Garber positions Bush’s methods in the context of an earlier experience he had with the application of quantitative social science methods “to test the assumptions and approaches of practitioners like myself who work on democracy assistance programs relying on instinct and internalized lessons from experience rather than on social-science research findings.” Bush’s book leaves him at best only “a partial convert” regarding the value of these methods: “Analytic rigor can lead social scientists to miss the practical challenges that confront implementers of democracy programs that operate in politically sensitive and often physically insecure environments.” Richard Youngs has similar reservations. Another important point of disagreement revolves around Bush’s analysis of the principal-agent relationship between the funders of democracy assistance and the NGOs that carry out such assistance on the ground. Deloffre highlights as especially innovative and valuable Bush’s analysis of this relationship—which emphasizes the autonomy and differing interests of the NGOs vis-à-vis their funders. The other reviewers express serious doubts about it. Schmitz worries that “the application of the principle-agent model here may also inadvertently lead Bush to underestimate the role of donors.” Garber argues that “the reality is that many organizations operating in the DG sector yearn for the type of autonomy and flexibility to design and implement programs that Bush suggests they wield.” In the same vein, Youngs comments that “many NGOs bemoan the focus on measurable outcomes,” seeing it as imposed by donors, not at all something they initiate on their own. In short, in pursuing what all of the reviewers agree is a well-conceived, well executed, and notably innovative effort to apply rigorous social science methods to democracy assistance, Bush has not only made an important substantive contribution by probing the crucial issue of how tame U.S. democracy programs are and whether they are becoming more so over time. She has provided one of the most substantial tests to date of the utility of such methods, one that will clearly be of considerable use in guiding the efforts of other scholars seeking to redress the long-standing imbalance between the enormous size of this field and the relatively modest amount of in-depth, independent analysis of it. Sarah Bush is Assistant Professor in the Department of Political Science at Temple University and a Senior Fellow with the Foreign Policy Research Institute. In addition to The Taming of Democracy Assistance: Why Democracy Promotion Does Not Confront Dictators (Cambridge: Cambridge University Press, 2015), she is the author of articles in journals including International Organization, International Studies Quarterly, and Comparative Political Studies. She received a B.A. in political science from Northwestern University and a Ph.D. in politics from Princeton University. Thomas Carothers, Vice President for Studies at the Carnegie Endowment for International Peace is a leading authority on international support for democracy, human rights, and governance. He has worked on democracy-assistance projects for many organizations and carried out extensive field research on aid efforts around the world. He also has broad experience relating to human rights, rule of law development, civil society building, and think tank development in transitional and developing countries. He is the author of six critically acclaimed books and many articles in prominent journals and newspapers. Maryam Z. Deloffre is an Assistant Professor of Political Science in the Department of Historical and Political Studies and the Master’s program in International Peace and Conflict Resolution at Arcadia University. Her research and publications examine transnational NGO accountability; the professionalization and standardization of humanitarian NGOs; human security and global health crises; and global humanitarian governance. Larry Garber is currently on detail from USAID to the Eisenhower School of National Security & Resource Strategy at the National Defense University. He has worked on development, democracy and human rights issues as a practitioner and policymaker for more than 30 years. The views expressed in this document reflect the personal opinions of the author and are entirely the author’s own. They do not necessarily reflect the opinions of the U.S. Agency for International Development (USAID), the United States Government or the National Defense University. USAID is not responsible for the accuracy of any information supplied herein. Hans Peter Schmitz is Associate Professor at the University of San Diego. His research focuses on the governance and effectiveness of international non-governmental organizations (INGOs), rights-based approaches to development, and global efforts to address noncommunicable diseases (NCDs). Richard Youngs is senior associate at the Carnegie Endowment for International Peace’s Democracy and Rule of Law program. He is also professor of international relations at Warwick University. UK. He is author of ten books, the most recent of which is The Puzzle of Non-Warwick Democracy (2015). 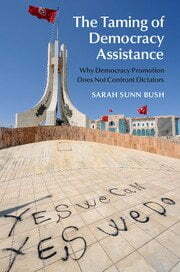 In an important contribution to the scholarship on Non-Governmental Organizations (NGOs), Sarah Bush explores how and why democracy assistance, which she defines as aid given with the explicit goal of advancing democracy overseas (4, 7), has been ‘tamed.’ Tame democracy assistance includes programs that are both regime compatible and measurable (7). Conventional wisdom primarily advances two factors (1) the preferences of donor governments and (2) the characteristics of target states to explain the design and effects of democracy promotion (8-9; 24-27). By contrast, Bush advances a transnational approach to democracy promotion that examines the role of organizations, often the designers and implementers of democracy promotion programs, in shaping the content of these activities. In an attempt to survive and thrive, organizations, in what she calls the democracy establishment, must secure donor funding and maintain access to target states; they do so by pursuing tame programs that do not jeopardize their organizational interests but also may not advance the cause of democracy. Bush adopts a sophisticated two-pronged argument that enables her to explore both how organizations’ strategic interests, professional norms and competition shape their preferences for tame programs. Bush first employs a principal-agent approach to theorize the problem; donor states rely on NGOs to deliver democracy promotion activities for a number of reasons (28), but delegation incurs costs and produces information problems that make it difficult for donors to observe and control these organizations. As such, she hypothesizes that the harder it is for donors to observe and control the organization, the more those organizations will pursue measurable and regime-compatible programs. This is a classic principal-agent problem in that the agent (i.e. NGOs) pursues programs which are amenable to its primary interests (to survive and thrive), and not to the stated interest of the donor (effective democracy promotion). The second part of the argument explains how competition and professionalization pressure organizations in the democracy establishment to converge on tame programs. Bush’s multi-method approach and varied evidence are particularly well-suited for testing her argument. Indeed, the book’s contribution to empirical knowledge on democracy promotion in general and more specifically to theories of organizational behavior is laudable in and of itself. Bush illuminates a sector of activity that is oft overlooked in studies of NGOs, which tend to focus on the humanitarian, human rights, and environmental sectors through original data sets of democracy assistance projects, interviews with members of the democracy establishment, case studies, and field research in Jordan, Tunisia and Washington D.C. Bush begins by categorizing democracy assistance projects (Table 3.1, 56) and then classifies programs along two dimensions: regime compatibility and measurability (Table 3.2, 57). She defines measurable programs as democracy-assistance efforts that are associated with country-level quantitative outcomes (40) and regime-compatible programs as those activities that are unlikely to threaten the survival of an incumbent regime (43). For example, measurable/regime compatible programs include good governance and constitutions, while measurable/not regime-compatible programs include human rights and elections. In Chapter 3, she briefly illustrates how measurable/regime-compatible programs compromise effective democracy promotion and thus sets the stage for testing the argument. Chapter 4 further builds momentum for the argument by testing, and substantiating, the hypothesis that tame programs occur when donors have more difficulty observing and controlling NGOs. Subsequent chapters round-out the analysis by investigating how the main variables affect the behavior of donors, international NGOs, and local activist groups: Chapter 5 examines the grant-making of two American donors—the National Endowment of Democracy (NED) and United States Agency for International Development (USAID)—in longitudinal perspective; Chapter 6 draws on case studies of Freedom House, the Institute for Democracy in Eastern Europe, and the Open Society Foundations; Chapters 7 and 8 investigate democracy promotion activities in Jordan and Tunisia. Evidence in these empirical chapters document overall shifts in democracy assistance towards tamer programs (Figure 5.4, 116; Figure 5.5, 128; Figure 7.3, 166; and Figure 8.2, 196) and support Bush’s theoretical argument that competition and professionalism foster a taming of democracy assistance. As with all groundbreaking scholarship, this book generates multiple avenues for further research. I focus on two that are related specifically to the scholarship on NGOs. First, the book raises several questions regarding the nature of the multiple principals problem (29, 32) and how it might impact organizational strategies. By leveraging the principal-agent approach adopted by the book and the book’s emphasis on the agency of organizations in the democracy establishment, future research could explore whether and how organizations might strategically choose donors to fit organizational needs. Acting in this way to secure funds would aggravate the multiple principals problem and require the organization to reconcile competing and conflicting interests. Some divergence in donor priorities is evident in the data, for instance Bush notes variation in European Union projects (99) and acknowledges that international donors fund different types of programs in Jordan (181). One could assume that emerging donors from Brazil, Russia, India and China (BRICs) countries or the Gulf States might further diversify the donor market. While Bush argues that professionalization and competition have led to convergence in the democracy establishment, the qualitative analysis is heavily focused on American donors, NGOs, and institutions, all of which exemplify one variety of activism. For example, Sarah Stroup argues that humanitarian and human rights NGOs’ organizational structures and strategies are deeply tied to national contexts, and because they are keenly attune to the limitations and opportunities of these contexts, organizational practices across these contexts should diverge rather than converge. Thus, organizations driven both by the motivation to thrive and the principled commitment to promoting democracy might ‘shop around’ for funds to leverage these contexts; perhaps using funding from American donors—who, Stroup argues, discourage political activism and emphasize efficiency—for tame programs, while using funding from French donors—who encourage political activism and emphasize effectiveness—for untame programs. Organizational-level analysis could take seriously the agency granted by Bush’s theoretical argument to determine whether and how organizations might play the donor market. Finding that an organization acts consistently, regardless of its funding source, would bolster Bush’s argument and provide further evidence of professionalization and competitive pressures. A second promising avenue for additional research could explore the content of and processes through which professional norms develop and diffuse in the democracy establishment. First, how did epistemic knowledge and shared normative and cause-effect beliefs (48) emerge in the democracy establishment? While this question is of course beyond the scope of the book, it points to a gap in our understanding of inter-organizational NGO dynamics. Members of the democracy establishment might share a commitment to promoting democracy, but how is democracy defined and who decides what best practices are? The data suggests that as the largest bilateral democracy donor (Table 4.1, 92), the U.S. sets the tone for programming in democracy promotion. To what extent were these best practices accepted or contested? For example in the humanitarian sector, attempts to develop collective NGO best practices generated contestation, conflicting definitions, and multiple, competing regulatory systems to govern humanitarian activity. Examining these dynamics would reveal the politics behind professionalization. On a final and related note, it is not clear how professional norms spread. Take the example of Tunisia, by 2012, as democracy assistance funding poured in, an influx of international NGOs quickly established a presence with the hopes of securing funding (200). This point is most likely related to Bush’s striking finding that professionalization proceeded in an accelerated fashion in Tunisia (198). How, and through what processes, did professional norms spread among NGOs? Bush mentions several possibilities, teaching and mimetic isomorphism (207), but others, such as social learning, are also possible. Identifying and specifying how and by whom professional norms diffuse merits further exploration and could elucidate inter-organizational power dynamics in the sector. The hallmark of a trailblazing book is its ability to provoke thought, ignite new areas of research, and generate stimulating questions. Bush’s Taming of Democracy Assistance will shape the NGO research agenda for years to come. In 2007, I was invited to participate on a National Academy of Sciences (NAS) panel that was tasked with reviewing the United States Agency for International Development (USAID)’s experience with evaluations of democracy and governance (DG) programs. My fellow panelists were all distinguished political scientists. At our first meeting, I asked my colleagues where they thought the writings of Tom Carothers, a long-time analyst of USAID programming in the DG sector at the Carnegie Endowment for International Peace, fit within our work plan. The response I received from a co-panelist was telling: “Tom is just a lawyer;” the intended implication was that he lacked the training to apply the academic standards that a NAS panel required. Over the next 18 months, I came to appreciate my colleagues’ seriousness of purpose and passion regarding the subject matter under investigation. I welcomed their use of social science methods to test the assumptions and approaches of practitioners like myself who work on democracy assistance programs relying on instinct and internalized lessons from experience, rather than on social-science research findings. They made a good case for the lessons to be learned from systematic evaluations and research. Yet, I remain only a partial convert. Analytic rigor can lead social scientists to miss the practical challenges that confront implementers of democracy programs that operate in politically sensitive and often physically insecure environments. Ultimately, our NAS panel reached consensus on most of the study’s conclusions and recommended a major commitment to greater USAID investment in more sophisticated evaluation techniques. But in the final report, I expressed skepticism that democracy and governance projects could be the subject to the same type of gold-standard, social-science experiments that are used in other development sectors. After reading Sarah Bush’s book, The Taming of Democracy: Why Democracy Promotion Does Not Confront Dictators, I feel the same way. Social science research can keep you honest, but it can only go so far in addressing the policy dilemmas that exist in the real world. Bush is concerned about a conflict of interest that keeps democracy organizations from pushing hard in non-democratic environments. She summarizes her argument as follows: “there is a clash between organizations’ desire to survive, which they pursue through tamer programs, and donors’ desires – however ambivalent at times – to advance democracy” (217). These organizations, which Bush describes as forming the democracy establishment, seek to please their donors by emphasizing “measurable” and “regime compatible” democracy assistance programs, as opposed to confronting dictators directly (13-14). As a result, in Bush’s view, democracy programs never go as far as they might. Organizations tilt their programs away from controversial efforts, such as establishing a free press or supporting human rights defenders, which Bush characterizes as “untame” projects that directly threaten autocrats, and focus instead on “tame” projects that do not contribute directly to democratic reform but are able to produce measurable results such as women parliamentarians or local governments trained (5). Rigorously assessing the consequences for democracy of the taming of democracy assistance falls outside the book’s scope and, unfortunately, is very difficult.… Both data availability and research design issues thus make it difficult to establish the causal effects of measurable and regime compatible democracy assistance on target countries’ democracy levels….To be clear, the evidence does not, and cannot, show that measurable and regime compatible democracy assistance impedes countries’ democratization in all cases or even on average. What it does show, however, is that such programs reinforce authoritarian survival in at least some instances, which is a necessary implication of my theory and a significant finding for our understanding of democracy promotion that merits further explanation (64-65). Let me start with a couple of methodological concerns. Bush’s argument is based on the analysis of a self-created, original data set, which assigns more than 14,000 democracy-assistance programs that were implemented over a twenty-plus year period into twenty categories (55-56). These categories range from programs addressing “civic education” and “human rights” to “elections” and “dissidents.” The twenty categories are then designated as “measurable/not-measurable” and “regime-compatible/not regime-compatible.” As Bush acknowledges, the assignment of specific donor programs into these twenty categories was not always straight-forward, given both information gaps and the fact that many democracy-assistance programs are multi-faceted and can fit into multiple categories (55). An even more fundamental question relates to the assignment of a given category to one of her four boxes (see the table on page 57). For example, all election programs are defined as measurable and not regime-compatible. To be sure, many of the well-known examples of democracy assistance success involve electoral transitions, where an authoritarian regime was either hostile to or ambivalent about the election assistance provided, and the assistance is properly categorized as not-regime compatible. However, the much more common form of election assistance today involves a government welcoming support to strengthen electoral management bodies, reform electoral laws, and introduce new electoral infrastructure. This is hardly the type of “non-tame” assistance suggested by categorizing all election programs as not-regime compatible. A key question facing U.S. policymakers during the past thirty years is how bureaucratically to provide democracy assistance in countries that range from close allies to hostile antagonists. Bush provides a useful description of the evolution of U.S. democracy assistance in the 1980s and 1990s, with considerable attention to the National Endowment for Democracy, a private foundation established by the U.S. government in 1983 and funded by appropriated resources, and less to USAID, the U.S. development agency that was established in 1961. Throughout the 1980s, most democracy assistance was provided as one-off programs with a democracy-promotion objective. Post-Cold war programs began to shift the paradigm, with democracy assistance now more broadly related to the societal transformations that the U.S. and European countries were encouraging in the former Soviet bloc. USAID was assigned primary responsibility for managing this growing democracy-assistance portfolio in large measure because of its existing accountability systems and extensive field presence. In 1993, USAID Administrator Brian Atwood promoted a more fundamental shift by redefining “sustainable development,” USAID’s overriding mission at the time, to incorporate democracy and governance as an essential element. The consequences of this redefinition of development were profound. Most obviously, democracy and governance became a full-fledged sector, with further funding increases provided for DG programming and, as Bush describes, the institutionalization of the sector to include: the establishment of a Center for Democracy and Governance, and Office of Transition Initiatives; the creation of a cadre of DG specialists; and investment in research, evaluation and dissemination of previous USAID DG efforts (127). At the same time, programs in the DG sector became subject to the same development-oriented processes for planning, implementing, and monitoring as are programs in other sectors. In general, this means that at USAID, still the largest and most influential democracy programmer, DG programs emerge from a country-development strategy and an extensive project design process. The programs are competitively procured through an often quite precise solicitation and are monitored by in-field staff to ensure compatibility with USAID development goals and U.S. government foreign policy objectives. Bush’s book misses the extent to which democracy programs now have to live by the same criteria as development assistance programs. She does not examine the implications of the planning process used by development-oriented donors, which increasingly encourages the identification of political, as well as economic, constraints to development and designing programs accordingly. Overcoming political constraints requires both political savvy, hence the current emphasis on political economy assessments and the broad definition of what constitutes a democracy assistance programs, and patience, i.e., a realization that democracy objectives are not necessarily going to be achieved in a short-term time frame. Donors appreciate the trade-offs between emphasizing effective aid and measurable programs, and do not assess programs based on whether a country’s Freedom House score improves in a given year. In practice, policymakers face three options with respect to implementing an assistance program in a country that is needy in socio-economic terms and democracy-deficient: providing no development assistance on the ground that the host government is not a good partner; providing, using somewhat separate tracks, development assistance and “non-tame” democracy assistance; or providing development assistance, including a democracy assistance component that is tempered (or tamed, to use Bush’s term) by what the host government will permit. The first option, in effect, reflects the approach adopted by the Millennium Challenge Corporation, but would limit the U.S. government’s ability to address a broad range of global challenges (including climate change, health pandemics, organized crime, gender discrimination, and incipient and on-going conflicts) if applied to USAID. The second approach has often been utilized by USAID, but as recent experiences in Russia, Bolivia, Egypt, and elsewhere illustrate, it carries risks of compromising the continued viability of the development program or the security of the democracy implementers. Thus, the third option is often the most viable, but clearly needs to be reinforced by the full panoply of democracy promotion tools available to the U.S. government: placing democracy and human rights issues high on the bilateral diplomatic agenda; utilizing various economic instruments of power as appropriate (e.g., trade access); and presenting consistent public diplomacy messages. Bush places considerable emphasis on the role of intermediary organizations, i.e., the program implementers. She asserts that there is a principal-agency problem between donors, who provide democracy assistance in furtherance of their democracy promotion objectives, and the implementers, who are motivated by their need to survive in a highly competitive market. Yet, as she acknowledges, countervailing geo-political considerations may affect the commitment of donors to democracy promotion in a particular country, even as they continue to fund programs under the democracy assistance rubric, and implementers include those who are politically committed to promoting democracy and human rights, even at a cost of their bottom-line. Moreover, the reality is that many organizations operating in the DG sector yearn for the type of autonomy and flexibility to design and implement programs that Bush suggests they wield. For the past two decades, U.S. policymakers, practitioners, and academics have debated whether to include democracy assistance as a core part of the development agency agenda. On the one hand, many argue that USAID democracy assistance programs inevitably will be tamed to ensure the continued implementation of more traditional development programs in countries with authoritarian tendencies; thus the suggestion to rely more heavily on private foundations. The counter-argument, now reinforced by Goal 16 of the Sustainable Development Goals adopted at the 2015 UN General Assembly, is that effective institutions, accountable governance, and robust respect for the rule of law are critical for the achievement of the other goals defined by the sustainable development agenda; thus, to disconnect democracy assistance programs from development efforts would represent a significant step backwards and would have the unfortunate political consequence of having the U.S. operate in authoritarian regimes without any programmatic commitment to support democracy in these settings. This long-standing debate has been complicated in recent years by the “closing space phenomenon” and the related backlash against democracy assistance that is being observed in many countries. As part of the closing space phenomenon, many governments have adopted laws to restrict the funding of domestic NGOs, while a few governments have gone further by prosecuting those who provide assistance to NGOs or by expelling donors operating in their country. In response, the U.S. Government has mobilized an international response to this backlash, including President Barack Obama’s convening of two high-profile meetings on the margins of the UN General Assembly in 2013 and 2014 that focused exclusively on this issue, and the White House issuance of a far-reaching Presidential Memorandum (PM) in September 2014 to promote a pro-active and coherent response across the U.S. government. The U.S. Government works with civil society organizations even when local laws restrict the ability of civil society organizations to operate or where local laws restrict the fundamental freedoms of expression, peaceful assembly, and association, with due regard for the safety of civil society interlocutors and their operations. Agencies engaged abroad shall oppose, through appropriate means, efforts by foreign governments to dictate the nature of U.S. assistance to civil society, the selection of individuals or entities to implement U.S. Government programs, or the selection of recipients or beneficiaries of those programs. Additionally, agencies engaged abroad shall review their internal regulations, policies, and procedures to ensure that programmatic requirements do not inadvertently impede civil society operations (emphasis added). Translating the PM’s bold rhetorical commitment into specific support for civil society actors in hostile countries requires consideration of several politically sensitive issues: Should the U.S. provide democracy assistance, which by definition should be overt and transparent, in countries where receiving assistance from the U.S. can amount to a crime? Should the U.S. provide assistance to a brave dissident who is willing to risk criminal prosecution when support for this individual may also result in the prosecution of others who are unaware of the source of the largesse flowing from the assistance? And should the U.S. provide support to the brave dissident when such assistance may compromise the on-going provision of life-saving humanitarian assistance? Policy-makers struggle with these questions every day in the most challenging political environments. Bush concludes that the data shows implementers taming themselves for their own organizational survival. In fact, their decisions reflect less the implementer orientation toward organizational survival and more the profound realization that choices regarding tame and non-tame approaches to democracy promotion, whether directed by a government donor or subject to an implementer’s discretion, have both geo-political and real-life consequences. Democracy programs are always challenging to implement and in many countries they can also be dangerous. Bush criticizes the taming of democracy assistance, but there may be real life-and-death reasons that smart, carefully-tailored programs may be the right outcome in certain circumstances. Since the end of the Cold War, democracy promotion abroad has become a controversial growth industry. While critiquing democracy assistance is not new, there is plenty of need for solid and compelling research on this topic. This book accomplishes just that by offering a detailed account of the challenges faced by this particular type of foreign aid. Sarah Bush brings together in her research the distinct perspectives of the key players: local activists, international non-governmental organizations (NGOs), intergovernmental organizations, and Western governments. The strength of the evidence is built around a new categorization of democracy assistance projects (Tables 3.1 and 3.2, 56/7) and the multi-level and longitudinal analyses of grantmaking (chapter 5), the professionalization of democracy assistance (chapter 6), and the responses to such programs in Jordan (chapter 7) and Tunisia (chapter 8). Each chapter here is a book topic in itself and showcases the author’s immense analytical breadth and depth brought to the most salient aspects of this topic. The core claim the book pursues is that NGOs that specialize in democracy assistance shape the implementation of programs and ultimately contribute to the ‘taming’ of democracy promotion abroad. Bush defines tame democracy assistance as programs that feature measurable results (40-42) and fail to challenge dictators (43-45). In challenging the conventional focus on states and donors as decisive players in this arena, Bush highlights the material interests of those who implement NGOs: these actors chose tamer programs because they needed to secure access to target countries (1) as well as keep donors happy by providing measureable outcomes of program activities (2). While funders of these programs may genuinely want to advance democracy, program reporting requirements push implementing NGOs away from the core purpose towards very limited, often quantifiable, and not necessarily meaningful outcomes. Examples of such tame programs are those focused on women’s representation, constitutional changes, or local governance. To support her core arguments, Bush uses a principal-agent model to explain why NGOs are more likely to pursue tame programs when monitoring is more difficult (86). Based on a comparison of programing by NGOs based in donor countries with those based in the target countries, Bush shows that the latter are more likely to implement tame programs (103). Since the former are easier to supervise by their principals, they are less likely to choose tame programs. Subsequent chapters then provide insights into the core causes of the progressive taming of democracy assistance. A core contribution of the book is contained in chapters five and six where Bush documents how democracy assistance changed over time, and highlights professionalization and competition as key drivers for tamer programming. Focused on the National Endowment of Democracy (NED) and a few major NGOs such as Freedom House, the chapters trace shifts over time in democracy-assistance funding and the rise in regime-compatible activities (Figure 5.4, 116). They also highlight a growing trend of professionalization that can lead NGOs to increase their focus on organizational survival while also pushing programs towards a “technical, portable, step-by-step process” (129). Bush is careful in discussing the methodological challenges and limitations of her data (64/5), while also putting her argument in the context of alternative explanations focused on the dominant role of donor interests. Importantly, Bush repeatedly argues that her focus does not evaluate whether democracy assistance is “good” or “bad” (5 and 63), but confines itself to explaining tameness, a characteristic which can be defined and operationalized. This does not prevent Bush from taking a stand for a confrontational approach as the only compelling one in advancing democracy. This tension between methodologically sound research and making broader claims raises two issues that may motivate additional research in this area. First, some may claim that the dichotomy established between tame and non-tame activities simplifies things too much in the name of academic demands for measurement and replicability. Programs should instead be assessed based on their relevance given the transition or consolidation stage and other local conditions. For example, just because any election-related activity is categorized ‘not regime-compatible’ does not mean that it makes sense in a given context. The proposed classification of programs makes for a strong research design, but it also makes it more difficult to get at the question of what actually works. We do ultimately want to know what is ‘good’ or ‘bad’ in terms of democracy assistance, which requires investigating program results, interaction effects, or unintended consequences. Still, the focus on taming is useful in advancing necessary discussions about effectiveness because it takes a clear (and contestable) stand with regard to what we should look for when judging programs. A second and related point then draws a different lesson from the fact that we do not really know enough about the effects of democracy assistance. Bush’s conclusion is to stay away from making pronouncements about what works, and instead to emphasize the intent of “confronting dictators” by supporting “competition and mobilization” (60). An alternative conclusion takes our limited knowledge of what works and doubles-down on a consequentialist logic of measurements and evaluation in an effort to continuously improve programs and their outcomes. In this view, professionalization is not the problem, but a necessary step in facilitating learning over time. To stay with the election example, Bush rightly points out that often “the presence of election monitors gauges the success of electoral assistance” (60), which identifies it as a quantifiable and measureable activity. But maybe the issue is not that things are measured, but that looking at inputs alone (for example, how many election monitors are present) fails to advance our knowledge about effectiveness. It is certainly plausible that professionalization can lead to a greater focus on organizational survival (216), but a focus on the impact of programs and how they change over time may (or may not) have revealed whether measurements also contribute to continuous program improvement. This defense of professionalization ultimately points back to the central role of the principal-agent model in Bush’s argument. The model assumes that the donor has the right intentions and ‘knows best,’ but cannot exert sufficient control over the recipients of financial support. This explains why the first policy recommendation Bush identifies in her conclusions is to enhance top-down observation and control (228). An emphasis on supervision makes most sense when we deal with relatively simple goals, linear causal chains, and well-defined attribution of results to program activities. Considering the complexity of democracy promotion as a goal, its theory of change likely involves nonlinear processes, long-term projections of outcome and impact, and significant challenges in measuring the results of program activities in comparison to unrelated factors shaping political developments. This suggests that the core problem is not insufficient supervision, but greater dialogue between funders and NGOs about their respective theory of change, how they ensure continuous learning, and in what ways local knowledge can be mobilized. Bush makes this point as part of her six policy recommendations (229), but it remains in tension with the strong emphasis on increased donor control. The application of the principal-agent model here may also inadvertently lead Bush to underestimate the role of donors. Bush does not argue that NGOs as agents agree to certain programs, but then fail to deliver during the implementation phase. This does not seem to be a story of ‘slippage’ or of donors being unclear about their expectations or being unable to force agents to do as they promised. If donors ultimately approved all the tame programs, then the question might be why they did so, not why agents did something other than what principals wanted. This suggests that research building on this study should focus additional attention on the changing relationships between donors and NGOs. Bush’s book effectively complicates the traditional focus on state interests by introducing NGOs as key players in their own right. Bush not only sets a very high research standard here, but greatly advances our understanding of the role of transnational relations and NGOs well beyond the issue area of democracy assistance. The questions that this book raises for subsequent studies highlight the nature of donor-NGO relationships as well as the effects produced by professionalization. Sarah Bush’s book is a timely, invaluable, and thought-provoking volume that offers a distinctive perspective on persistent shortcomings to democracy-support efforts around the world. As others in the roundtable review will in all likelihood have described the book’s contents, its place within the academic literature, and the large parts of it that are concerned with social science methodology, I focus my comments on questions related to policy developments. The book covers much ground that is familiar to studies of democracy promotion, but claims to offer two main innovations. The first is its emphasis on the extent to which Non-Governmental Organizations (NGOs) that implement projects condition the nature of democracy support. The second is the book’s argument that democracy assistance has become increasingly tepid, or, in Bush’s words, ‘tame’. Both of these two central claims contain elements that are convincing and important to the field of democracy support. Arguably, however, they also require more balanced interrogation and raise a further set of questions related to recent policy developments in international democracy support. With regards the first claim, Bush’s book is nuanced enough not to claim that democracy promotion NGOs completely displace governments’ strategic calculations, but rather argues that a more ‘complete’ explanation of democracy assistance should take into consideration NGOs’ preferences and influence. In this claim, Bush is surely right and makes a valuable addition to the literature. However, one wonders how far it is possible to generalize on this point, given the vast range of NGOs which are involved in democracy support. The book’s argument sits uneasily with the most frequent complaint raised by those civil-society organizations most active on the ground within the target states of democracy policies, namely that donors give them very little space to set their own agendas. Bush argues that NGOs are responsible for ‘tame’ democracy support to the extent that they push for projects with overly diluted and measurable outcomes, because this enables them to signal success to donors – she contends that this militates against supporting ‘political mobilization’ against regimes. Yet, in fact many NGOs bemoan the focus on measurable outcomes. They see it as being imposed by donors and unsuited to political work, which is qualitatively different from other types of development aid oriented towards building hospitals or schools, for instance. Many small, local NGOs from target countries are particularly hostile to the kind of quantitative measurable outcomes that donors foist upon them – something that does not fit well with Bush’s insistence that such measurable indicators come mainly from the risk-averse NGO world itself rather than donors. (5) Moreover, it is unclear why the push for measurable outcomes in itself necessarily produces ‘tame’ projects. Measurable indicators could be ‘un-tame’ – the number of protests supported against a government, for example. The book’s second claim – that democracy assistance is becoming increasingly ‘tame’ over time – raises vital questions about the future viability of international democracy policies. While Bush is clearly right to outline the increasing ineffectiveness and ambivalence that beset democracy support policies, one wonders if some updated nuance is not warranted on this point. The book’s assertion that much democracy assistance has become more ‘tame’ is a sound conclusion, if not an especially new one within the policy world. Bush suggests that this trend can be partly explained by the fact that regimes in target countries restrict access to civil society funding and that this is obliges NGOs to limit themselves to very cautious political aid initiatives. On this point, the analysis in effect corroborates a trend that is now well established and much commented on. One caveat, however, is that what many NGOs struggling in these repressive conditions want is not so much tamer international funding but more flexible funding that would enable them to circumvent regime crackdowns. Moreover, if the book hinges upon the observation that regimes are becoming more obstructive to harder-edged democracy support, it would have been useful to have a broader range of evidence to explain exactly what political obstacles have been raised in target countries – a question on which the book provides only sketchy and ad hoc examples. Bush’s other, very distinctive explanation, is that increasingly ‘tame’ democracy assistance is the result of competition between NGOs – the product, that is, of the internal dynamics of what she calls the “democracy establishment” (10). Even if this is part of the equation, however, one wonders if the book rather over-emphasizes this internal dynamic relative to the hugely significant shifts in international geopolitics in recent years – and the way these have fundamentally changed some of the core drivers and inhibitors of democracy support. In this sense, it might be asked whether the book’s data fully captures such recent political trends. The statistical correlations upon which the book’s main claims are based are enlightening but many of these based on data from 2010. They omit the last five years of trends within democracy support – a period in which the whole context for, and approach towards, democracy support has undergone major change. If anything, the trend among European democracy-support organizations runs the other way today: after many years of the soft and indirect approach, many of these organizations are moving towards a more political approach, one that is less exclusively based on the non-confrontational grass roots and developmental-type projects that have failed to produce the results that donors desired. Several European donors have broadened out their project indicators to include a wide range of political and power-related obstacles to effective democracy support; many of these do not now correspond to the superficial and mechanistic measurement variables that Bush accuses NGO intermediaries of pushing in order to demonstrate easy success. In the EU context, the big news of recent years has been the creation of the European Endowment for Democracy, an organization ostensibly set up as an explicit antidote to all the features of ‘tame’ assistance that Bush describes. Moreover, the book misses what was the main cause of ‘tameness’ in EU external civil society support, namely stricter funding rules introduced after a slew of corruption cases. These funding rules were designed to prevent European money from going missing or being untraceable, and have for two decades restricted funding mainly to large NGOs, with already solid institutional structures and that are formally registered under their home country legislation. These rules have done more than anything else to prevent EU funds from reaching more organically-rooted, political, and movement-based organizations. Far from supporting these rules, NGO implementers have for a long time been lobbying the EU institutions to change their financial regulations to allow for a less ‘tame’ range of democracy funding. Of course, such developments and details do not entirely invalidate Bush’s arguments, but in my opinion they do suggest the need for a nuanced analysis given the varied trajectories of different donors over time and the range of positions adopted by NGOs involved in democracy support. A final issue that requires further debate relates to the inevitable problem of how one defines a ‘tame’ democracy aid program. Bush suggests that a tame initiative is one that does not “confront” a non-democratic regime (57-61). But, arguably, this simply pushes the question on to asking what we mean by ‘confronting’ a regime. The author argues that some categories of democracy aid are intrinsically ‘regime-compatible’ while others are not. It seems to me that this rather simplifies and overly schematizes the real world of democracy aid. One political party program may be highly confrontational while another works with a regime’s blessing. It must be questionable that some of the types of support the book lists as regime-compatible – for example, support in writing more democratic constitutions – are really more ‘tame’ than some of those it lists as confrontational – like support for research or trade unions. This definitional problem is a perennial issue within work on democracy promotion. Whether a given democracy program is ‘regime-compatible’ or not depends on the political context and requires that its long-term impact be monitored. And trying to determine this impact is the very conundrum of democracy promotion – it is not something that can be determined a priori as a means of classifying different types of democracy support. Bush’s schema does not resolve this question, although her impressive book adds valuable insights that will help sharpen the quest for democracy support that is not so insipidly tame. I am deeply grateful to Maryam Z. Deloffre, Larry Garber, Hans Peter Schmitz, and Richard Youngs for their thoughtful reviews of my book, The Taming of Democracy Assistance: Why Democracy Promotion Does Not Confront Dictators. I also thank the editors of H-Diplo for organizing this roundtable and bringing together a group of reviewers who bridge both theory and practice and who work on issues related to democracy assistance as well as the role of non-state actors in world politics more generally. This group aptly represents the intended audiences for my book. It is also an honor to have Thomas Carothers – who has done so much to advance our understanding of democracy assistance – introducing the roundtable. I am pleased that the commenters appreciate many aspects of The Taming of Democracy Assistance. They share my observation that much of democracy assistance today is relatively ‘tame.’ Moreover, they agree that it is important to examine the role of non-governmental organizations (NGOs) in this phenomenon. These points of agreement have implications for how policymakers and practitioners ought to think about reform to democracy assistance going forward as well as for how scholars ought to study international influences on domestic politics and international NGOs in the future – points to which I will return later. The reviewers also identify a number of important critiques. In many cases, their comments get to the heart of the theoretical and empirical challenges with which I grappled when trying to execute this project. Building on Carothers’s excellent summary of the main themes raised by the contributors, I have organized my response to focus on four overarching issues: the definition and measurement of “the taming of democracy assistance,” the logic of my argument about the sources of this phenomenon, the policy implications that I derive from my findings, and the directions that future research on this topic should take. The puzzle that lies at the heart of The Taming of Democracy Assistance is that – despite heated rhetoric in the media about democracy promotion – few of the activities that take place around the world under the title of ‘democracy assistance’ actually challenge authoritarian governments. Whereas many programs in the early, Cold-War era of democracy assistance confronted dictators head-on by aiding dissidents and political parties, programs today are more likely to pursue technical activities, such as supporting local governance or building the capacity of local women’s organizations. The book is careful to emphasize that these ‘tame’ programs are not the same thing as ‘bad’ programs; the book is not about whether democracy assistance is effective at promoting democracy, per se. Rather, the book observes that these tame activities can be thought of as having been “reclaimed from the wild state” of confrontational Cold War democracy promotion and consequently as “less adventurous and overtly political” (5). I am not the only observer of democracy assistance who has noted the relatively tame nature of many contemporary democracy assistance programs. For example, Lincoln Mitchell, a scholar-practitioner who in 2016 published a fascinating book on The Democracy Promotion Paradox, wrote that “Today, democracy assistance funding often goes to benign and even mundane-sounding projects.” Similarly, in a compelling article, Thomas Carothers has noted the distinction between “political” and “developmental” approaches to democracy aid, the latter of which has much in common with the taming phenomenon described in my book. Although it speaks to such oft-observed trends, The Taming of Democracy Assistance makes a unique contribution in that it systematically defines and measures the phenomenon of tame democracy assistance and then develops an original theory to explain the sources of this taming. Tame programs are defined as those that have two separate characteristics: (1) they are relatively measurable, which is to say that they are “linked to quantitative or otherwise clear and objective indicators of progress at the level of the country” (57); and (2) they are relatively regime compatible, which is to say that they are programs that “target-country leaders view as unlikely to threaten their imminent survival” (60). In combination, measurable and regime compatible programs represent a relatively bureaucratic and technical approach to promoting democracy. To operationalize this definition, I classified particular categories of aid as being more or less measurable and regime compatible and thus more or less tame. Schmitz is correct to suspect that “some may claim that the dichotomy established between tame and non-tame activities simplifies too much in the name of academic demands for measurement and replicability.” Indeed, Garber points out that electoral assistance – a category that I code as ‘non-tame’ because it generally seeks to foster political competition – is often implemented in practice in ways that do not challenge, or even reinforce, electoral authoritarian regimes. Similarly, Youngs argues, “One political party program may be highly confrontational while another works with a regime’s blessing.” These critiques are fair. Although the typology of tame and non-tame programs was explicitly about “general tendencies,” I agree that there are many exceptions to my typology (63). The resulting measurement error introduces some ‘noise’ into my empirical analyses; it should not, however, bias my findings unless this noise systematically increases the likelihood of finding a relationship between the factors my theory identifies – such as delegation relationships – and tame programs. Future research could and should use a more refined classification scheme to improve on the typology I laid out. I further agree with Schmitz that the most promising way forward is to drill down into the local dynamics within a smaller set of country cases. This approach would allow us to think about which types of programs tend to be more measurable and regime compatible, given a particular country’s regime type and other characteristics. To understand why and under what conditions tame programs occur, The Taming of Democracy Assistance advances a two-stage argument. The first stage of the argument emphasizes how the often lengthy process through which many democracy assistance programs are funded – wherein government donors fund aid agencies, inter-governmental organizations, and private foundations, which then fund non-governmental organizations from the developed world, which in turn fund non-governmental organizations from the developing world – shapes the way that democracy assistance works on the ground. I argue that this long chain of delegation makes it difficult for donor officials to observe the projects that they fund. Given that reality, the organizations that implement democracy aid overseas tend to focus on programs that are associated with measurable outcomes (which help satisfy far-off donors) and that are relatively regime compatible (which help secure and maintain access in countries that may be hostile to democracy aid). The second stage of the argument emphasizes the roles of professionalization and competition within the field of democracy aid, which I refer to as the ‘democracy establishment.’ Increased competition and growing professional norms within the democracy establishment encourage organizations to focus on programs that will help them survive and thrive as organizations. In many cases, such programs are relatively tame, since funding concerns encourage organizations to focus on programs that are apt to generate measurable results and access concerns encourage them to focus on programs that can be pursued in many countries around the world. Organizations involved in democracy assistance thus behave like ‘normal’ organizations, despite the deeply political rhetoric associated with their work. Different reviewers take issue with different facets of my theory. Schmitz and Youngs both suggest – in different ways – that I overstate the importance of delegation dynamics. The Taming of Democracy Assistance does not overlook the role of government donors. Indeed, the book explicitly theorizes and tests the role of government donors (see Hypothesis 6 on page 51), finding – in line with Youngs’s point – that the rise of measurable democracy assistance programs is the result of government donors’ increased demands for measurement (122). I further note, however, that this phenomenon has its roots in the professionalization of democracy assistance and the rise within donor governments of particular ideas and norms associated with new public management (48-49). Another important finding is that government donors often give out tamer aid to countries with which they have a greater affinity or strategic relationship (98, 120, 165-169). In these ways, I theorize and test donors’ interests alongside and in conjunction with NGO preferences in The Taming of Democracy Assistance. That being said, my book concentrates on the role of non-state actors in the design and implementation of democracy aid. This focus was intended as a corrective to perspectives on democracy assistance that only examine donors’ interests. At the same time, I hope that future research will do more to understand donors’ changing relationships with NGOs and variations in donors’ preferences related to democracy assistance more generally, including differences across time, space, and donor type. Chapter 4 begins this type of analysis by looking at the implications of variations in donors’ abilities to observe and control democracy aid, but much more can be done in this regard. Deloffre asks questions designed to further probe the argument about professionalization. She seeks to better understand where shared ideas about democracy assistance came from, to what extent they are accepted or contested, and how these ideas diffused throughout the NGO community engaged in democracy assistance. These are excellent questions. In seeking to illuminate the effects of a shared professional culture and norms within the democracy establishment, the analysis in The Taming of Democracy Assistance necessarily skirted over variations within the democracy establishment related to organizations’ nationalities, sizes, staff composition, and funding sources. Exploring such variation is an important task for future research. In fact, I have begun to explore this topic in a subsequent article that focuses on the effects of differences between American and non-American organizations involved in the implementation of civil society aid. However, as Deloffre rightly observes, this research agenda is at an early stage and more analysis is warranted. The concluding chapter of The Taming of Democracy Assistance lays out six policy recommendations in light of the book’s findings. Many of the recommendations suggest ways that donor officials who prefer to avoid tame programs can do so, such as by improving their ability to observe and control organizations in the democracy establishment and finding ways to insulate democracy assistance from competing foreign policy pressures. At the same time, I recommend that policymakers work with professional networks to foster effective learning. I agree with Schmitz that – since professionalization is a fact of life in democracy assistance and development assistance more generally – it is essential to think about strategies for using professional institutions to facilitate effective learning. Garber offers some important critiques of the book’s policy recommendations. In particular, he notes that it is difficult – even dangerous – in many cases to implement democracy aid that is more confrontational towards authoritarian regimes. I agree. It is precisely these difficulties and dangers that I suggest prompted democracy promoters in Jordan – where members of the mukhabarat (secret police) show up at foreign-funded training sessions for political parties (176) – to pursue activities that are regime compatible. Such adaptation is eminently understandable. In a world in which governments have arrested staff associated with NGOs seeking to aid democracy in part because of these NGOs’ politically sensitive activities, one cannot reasonably or responsibly ask such organizations to take a more confrontational stance. What is the best solution for democracy promoters to pursue in light of these challenges? One strategy – which my interviews suggest is dominant in the field – is for organizations in the democracy establishment to continue working in difficult environments, even if all that is possible there is to design and implement regime compatible programs. Another strategy is for donors to fund democracy assistance programs in fewer countries and to invest more in countries in which conditions allow organizations to work under fewer constraints. Which strategy would be more effective at promoting democracy remains an open question, but I think it is a question worth discussing among scholars and practitioners who care about advancing democracy. In addition to some ideas mentioned above, the reviewers’ comments suggest a number of promising ways that future researchers might extend the analysis in The Taming of Democracy Assistance. I highlight two here. First, Deloffre and Youngs highlight the value in exploring the effects on the design and implementation of democracy assistance of new donor countries and organizations engaged in democracy promotion. I disagree with Carothers’s statement that The Taming of Democracy Assistance concentrates on the assistance of the United States: In fact, the book includes a number of donors in its analysis. Although two of the empirical chapters (5 and 6) do primarily focus (for research design reasons) on donors and organizations based in the United States, which is the largest donor government in dollar terms, four others (3-4 and 7-8) use a wider lens and include a number of European and other donors in their quantitative and qualitative analyses. Nevertheless, Deloffre and Youngs are right to suggest that new donors may adopt new approaches to democracy aid. A very interesting study in this regard comes from Tsveta Petrova, who shows how a mixture of principles and pragmatism – similar to what is described in The Taming of Democracy Assistance – characterizes the actions of democracy promoters from Central and Eastern Europe. Moreover, and as Deloffre notes, the arrival of new donors has the potential to exacerbate the “multiple donors” problem described in the book (35), whereby aid recipient organizations can choose to solicit funding from donors that are most likely to allow them to implement their preferred projects. Second, Youngs emphasizes that the last five years of democracy aid – which are generally studied in less depth in the book – have presented numerous new challenges and opportunities. He is correct, and it will be important for future research to explore whether the theory advanced in The Taming of Democracy Assistance sheds light on these trends. My argument suggests that increased restrictions on civil society assistance will prompt a further taming of democracy assistance. It also suggests that the advent of new donor organizations – such as the European Endowment for Democracy, which Youngs highlights in his review – will bring about new types of programs. However, my findings about democracy assistance in Tunisia since the 2011 revolution suggest that the professionalization of the democracy establishment means that organizations will gravitate toward tame programs even when local conditions or donor governments’ do not demand them. The implication of these findings is the pressures that encourage a relatively technical, non-confrontational approach to democracy assistance have become only more intense with time. In the future, it is possible that democracy assistance will become so tame that there is an opportunity for upstart NGOs to appeal successfully to frustrated donors by committing themselves to a more confrontational approach. In the case of this type of innovation, it will be interesting to see how the existing norms within the democracy establish change or continue. In writing The Taming of Democracy Assistance, I sought to stimulate new thinking about the design and implementation of democracy aid. I also sought to draw attention to the centrality of non-state actors to various types of international aid and pressure, and to develop a general theory about how non-state actors’ practices evolve over time in the pursuit of their ideals and interests. The contributions to this roundtable fruitfully suggest ways in which future research might build on my theory and research to deepen understandings of these and other aspects of democracy promotion. Again, I thank the contributors for their thoughtful engagement with my book and their many ideas for how to improve and extend this research agenda going forward, with the ultimate aim of further understanding and continuing to improve the quality of democracy assistance in the years to come. See for example, Lincoln A. Mitchell, The Democracy Promotion Paradox (Washington DC: Brookings, 2016); Judith G. Kelley, Monitoring Democracy: When International Election Observation Works, and Why It Often Fails (Princeton: Princeton University Press, 2012); Neilli Babayan and Thomas Risse, “0Democracy Promotion and the Challenges of Illiberal Regional Powers,” Democratization, Special Issue, Vol. 22, No. 3, May 2015. Sarah S. Stroup, Borders among Activists: International NGOs in the United States, Britain and France (Ithaca, N.Y.: Cornell University Press, 2012). See, Thomas Carothers, Critical Mission: Essays on Democracy Promotion (Carnegie Endowment for International Peace, 2004); Carothers, Aiding Democracy Abroad: The Learning Curve (Carnegie Endowment for International Peace, 1999); Carothers, In the Name of Democracy: U.S. Policy Toward Latin America in the Reagan Years (University of California Press, 1993), and Carothers and Diane de Gramont, Development Assistance Confronts Politics: The Almost Revolution, (Carnegie Endowment for International Peace 2013). National Research Council, Committee on Evaluation of USAID Democracy Assistance Programs, Improving Democracy Assistance: Building Knowledge Through Evaluation and Research, (Washington, DC: National Academies Press, 2008): 8. USAID, 1993. Strategies for Sustainable Development. USAID’s most recent general strategy document issued in 2011 seven core objectives, including “Democracy: Supporting the next generation of democratic transitions.” USAID 2012. USAID Policy Framework: 2011-2012, 25. USAID, 2013. USAID Strategy on Democracy, Human Rights and Governance, 5-6. Tom Carothers and Saskia Brechenmacher, Closing Space: Democracy and Human Rights Support Under Fire (Carnegie Endowment for International Peace, 2014); Tom Carothers, The Closing Space Challenge: How Are Funders Responding? (Carnegie Endowment for International Peace, 2015). White House, 2014. Fact Sheet: US Support for Civil Society. White House, 2014. Presidential Memorandum – Civil Society, https://www.whitehouse.gov/the-press-office/2014/09/23/presidential-memorandum-civil-society. Lincoln A. Mitchell, The Democracy Promotion Paradox (Washington, D.C.: Brookings Institution Press, 2016), 4. Thomas Carothers, “Democracy Assistance: Political vs. Developmental,” Journal of Democracy Volume 20, Number 1 (January 2009), 5-19. Sarah Sunn Bush, “When and Why is Civil Society Support ‘Made-in-America’? Delegation to Non-State Actors in American Democracy Promotion,” The Review of International Organizations, forthcoming. The most famous recent example is Egypt, although the repression of foreign aid to civil society is unfortunately common. See Griff White, “NGO workers convicted in Egypt,” June 4, 2013, https://www.washingtonpost.com/world/ngo-workers-convicted-in-egypt/2013/06/04/dacbcc2a-cd2e-11e2-8573-3baeea6a2647_story.html, and Kendra Dupuy, James Ron, and Aseem Prakash, “Hands Off My Regime! Government Restrictions on Foreign Aid to Non-Governmental Organizations in Poor and Middle-Income Countries,” World Development, forthcoming. Tsveta Petrova, From Solidarity to Geopolitics: Support for Democracy among Postcommunist States (Cambridge: Cambridge University Press, 2014).